Though the team had little doubt the moons are real, they were happy to see the moons show up very close to the locations predicted from the earlier Hubble observations. The initial discovery is being reported today in this week's edition of the British science journal Nature. The moons' orbits are in the same plane as the orbit of the much larger satellite Charon (discovered in 1978). This likely means the moons were not captured, but instead were born, along with Charon, in what is commonly theorized to have been a titanic collision between two Pluto-sized objects over 4 billion years ago. A team of astronomers, led by Hal Weaver of the Johns Hopkins Applied Physics Laboratory in Laurel, Md., and Alan Stern of the Southwest Research Institute in Boulder, Colo., made the new observations on Feb. 15, 2006, with Hubble's Advanced Camera for Surveys (ACS). Astronomers believe that the formation of the Pluto system is similar to that of our Earth and Moon. In both cases a comparable-sized body slammed into the parent planet. Simulations show that debris from the collision would go into an orbit around the planet and coalesce to form one or more satellites. Investigating how Pluto ended up with three moons while the Earth has only one should yield valuable insights into the processes by which satellite systems form around planets. The team will use Hubble again on March 2 to study the new moons. They hope the follow-up observations will provide information on the moons' color, as well as their size and shape, which could yield further clues about the formation and evolution of the Pluto system. 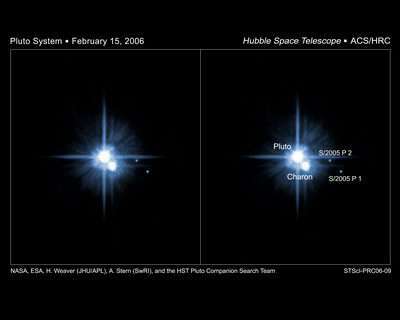 In the Hubble image, Pluto is in the center and Charon is just below it. P 1 is to the right and just below Charon. P 2 is to the right of Pluto and Charon.